After initial selloff, the US markets staged an impressive rebound overnight. DOW hit as low as 24077.56 but reversed to close at 24307.18, up 0.15%. S&P 500 gained 0.31% while NASDAQ rose 0.76%. However, investor sentiments turned sour again in Asian session as China leads decline again. At the time of writing, Shanghai SSE composite is trading down -1.27%. Hong Kong HSI is back from holiday and is down -2.73%. Nikkei is down -0.83%. Singapore Strait Times is down -0.49%. In the currency markets, Yen and Dollar continue to be the strongest one for the week, with Yen slightly stronger for today. New Zealand Dollar remains under broad based pressure. Australia Dollar, while staying the second weakest for the week, recovers as RBA didn’t deliver any dovish surprise. Technically, AUD/USD’s break of 0.7328 support overnight suggests down trend resumption. Further fall is now expected to next projection level at 0.7229. 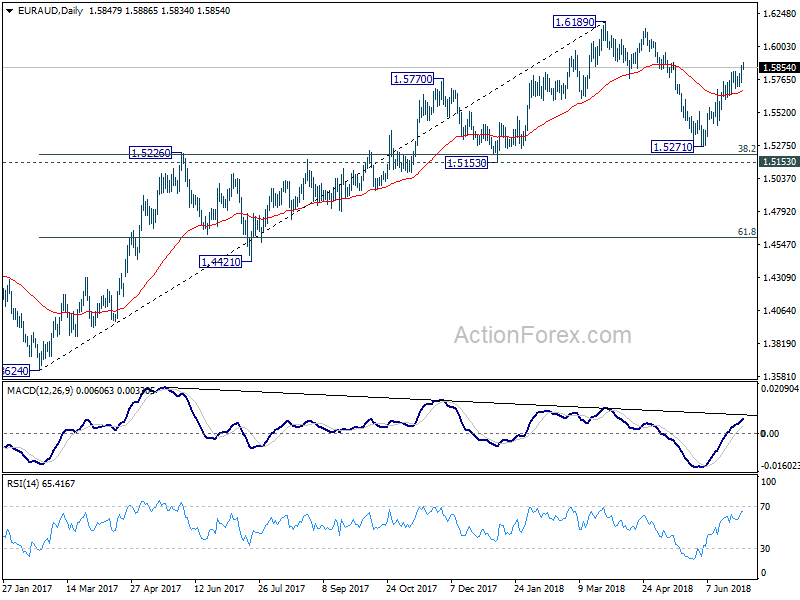 EUR/AUD extended recent rally to as high as 1.5886 and its on course for 1.6 handle. USD/JPY is struggle to find momentum after breaching 111 and we might see more consolidations first. 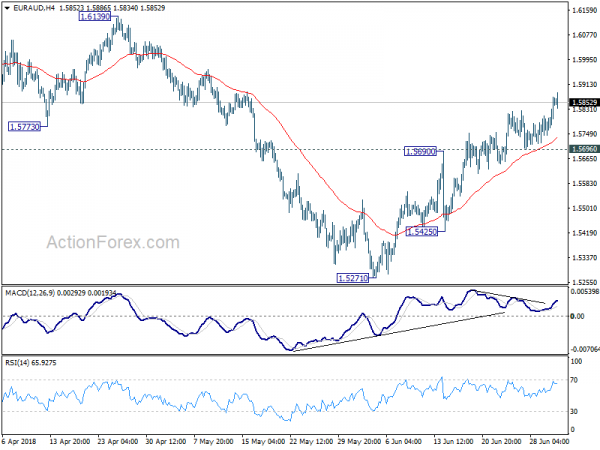 EUR/USD and GBP/USD are saying in range above 1.1507 and 1.3048 as consolidations are extending. A more notable change is that RBA omitted “An appreciating exchange rate would be expected to result in a slower pick-up in economic activity and inflation than currently forecast.”. It looks like, after the depreciation since January, RBA is less concerned on exchange rate. In an CNBC interview, Tony Fratto, deputy press secretary under President George W. Bush, blasted the idea of leaving WTO. He said, “to say that the United States is a loser in a WTO world is just completely inaccurate. We created the WTO as the dominant economy in the world to serve our interests.” While improvements are needed, there are better ways than “to hold it hostage and to threaten to pull out of it.” And He added that pulling out of WTO is a “ridiculous idea”. The Nikkei Review reported earlier this week that BoJ will likely lower inflation forecast at the upcoming quarterly Outlook for Economic Activity and Prices. The new projections will be published after July 30-31 meeting. Back in April, BoJ projected inflation to hit 1.3% in fiscal 2018 and 1.8% for fiscal 2019. In the upcoming projections, BoJ could lower than to 1.0% in fiscal 2018 and 1.5% in fiscal 2019. That will bring the figures in-line with forecasters surveyed by Japan Center for Economic Research, which expected 0.94% inflation in fiscal 2018. BoJ scrapped its “timeline” of hitting 2% inflation target around fiscal 2019, back in the April statement. But it’s been clarified multiple times by BoJ communications that the “timeline” was merely a projection, not a target. Japan monetary base rose 7.4% yoy in June, below expectation of 8.4% yoy. Australia building approvals dropped -3.2% mom in May, below expectation of -1.0%. UK PMI construction, Eurozone retail sales will be featured in European session. Canadian PMI manufacturing and US factory orders will be featured later in the day. Daily Pivots: (S1) 1.5780; (P) 1.5826; (R1) 1.5903; More…. EUR/AUD’s rally continues today and reaches as high as 1.5886 so far. Intraday bias is now on the upside as rise from 1.5271 should target a test on 1.6139/89 resistance zone. However, as the rebound from 1.5271 is not clearly impulsive yet and momentum isn’t too convincing. Break of 1.5695 minor support could be an early sign of near term topping. In such case, focus will be back on 1.5425 support. In the bigger picture, current development suggests that fall from 1.6189 is a corrective move and has completed at 1.5217 already. Key support levels of 1.5153 and 38.2% retracement of 1.3624 to 1.6189 at 1.5209 were defended. And medium term rise from 1.3624 (2017 low) is not completed yet. Break of 1.6189 will target 1.6587 key resistance (2015 high).